Explore the juxtaposition of art and history along the Oswego and Erie canals in Oswego and Onondaga counties. Experience vibrant arts centers and interesting tours of modern and historical facilities. Take a walk down a quaint historic street, through fascinating museums, shops and a thought-provoking gallery. Begin your tour along the historic Oswego Canal in the Port City. Explore 300 years of maritime history at the H Lee White Maritime Museum, located on a pier overlooking the harbor of America’s oldest freshwater port. 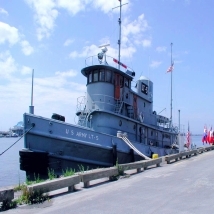 Climb aboard the National Historic Landmark “LT-5,” a U.S. Army tugboat and veteran of the Normandy Invasion of World War II; “Lance Knapp,” the last steam-powered vessel on the Barge Canal; and Derrick Barge No. 8, a 1925 NYS Canal boat. View a vast display of artifacts including ship models, navigation equipment and nautical paintings. Continue from the pier along historic West First Street to take in the exquisite architecture of an Underground Railroad site, the Buckhout-Jones Building. Stop into Canal Commons to find the perfect gift at the artist-owned co-op, Riverside Artisans; browse a fine selection of wines, coffee, or tea at Andrew’s Wine Cellar and Taste the World; or pick up a sweet treat at Man in the Moon Candies. After lunch, walk along the Oswego Canal to Lock #3. Along the way, view the Salvation Army Building mural by local artist Ben Jerred which depicts the city’s history on the canal and pays tribute to the former L.C. Smith Hunter Arms Company. Enjoy a guided tour of the canal facility, learn what it takes to operate a lock, and possibly see a lock operator in action. (This is a seasonal venue.) Step across the street to the Arts Center to view assorted artwork in a variety of mediums from local artists. Browse the gallery and add a new piece to your own collection. Make your way to Syracuse to visit the Erie Canal Museum where you will learn more about the history of this incredible man-made endeavor. Located in the only weigh-lock building still in existence in the U.S., the museum tells the story of the canal through exhibits, prints, photographs, documents and rare books.